When Rav Dovid Hofstedter of Toronto founded Dirshu 14 years ago, no one could have foreseen the success of how big it would grow. Today over 100,000 yungerleit on 6 continents, have learned millions of blatt Gemara over tens of millions of hours – and have been successfully tested on all of it. By undertaking the monthly bechinos on Daf Yomi, Daf HaYomi B’Halacha, Mishnayos and Mishna Berurah, they have shown that diligent Torah learning is their highest priority in life. This summer Dirshu program participants from across the globe will iy”h gather at the various locations for the Dirshu World Siyum and offer heartfelt shevach v’hoda’a to Hashem for their historical chelek in Torah. This glorious kesser Torah will illuminate the world. Torah is their life’s joy, fulfillment and toil. In honor of the grand events, Dirshu is honored to present to program participants, their families – and all of Klal Yisroel – songs of simcha and hisorerus that reflect the heartfelt emotions that engulf us. Several months ago, the organization reached out to a number of composers, and asked them to create compositions in honor of this momentous event. Many composers rose to the challenge and created spectacular songs. However at the end of the day Dirshu chose two of Moshe Laufer’s stellar compositions to be anthems of their upcoming siyum hashas. The other two songs were written by Rav Dovid Hofstedter, Nasi of “Dirshu” Worldwide. While Moshe Laufer was just contacted for the compositions, he was so impressed with the work of this amazing organization and what they are doing for Klal Yisroel, that he wanted a bigger role in this production. Moshe then decided to arrange and conducted ALL of the music for this unique project. With songs like these gems it was important to get singers who could really give over their meaning and simcha to the listeners. It was then that chassidic superstars Reb Isaac Honig, Reb Shloimy Daskal and Reb Yermiah Damen were approached to sing on this album, which the happily agreed to do. The fourth song on the album features Eli Laufer and yeled hapella Efraim Manat. All of the choirs were arranged by Eli Laufer. 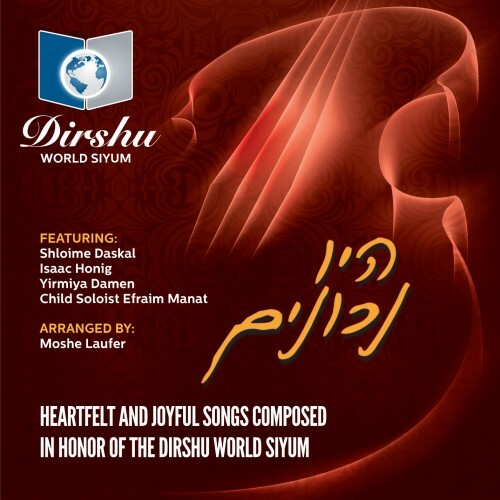 Hoyu Nechonim will be sent to all members to Dirshu and is being distributed by Sameach Music to stores worldwide. It is also available on Sameach Music’s website www.JewishJukebox.com. Hoyu Nechonim is being sold at a special price, JUST $2.99.